(Bloomberg) -- The House Financial Services Committee is hiring a Senate lawyer with deep experience conducting complex investigations to help run its upcoming probe of Deutsche Bank AG, according to people briefed on the matter. The hiring, said attorneys and others who’ve dealt with Roach, is a signal that the committee’s oversight of Deutsche Bank –- one of the few banks that extended loans to Trump in recent years –- won’t be a political rush job. Instead, Roach is known for conducting thorough reviews of thousands of documents, interviewing lots of witnesses and writing lengthy reports that often lead to new legislation and other reforms. Roach declined to comment. A spokesman for the Financial Services committee didn’t immediately respond to a request for comment. A spokesman for Deutsche Bank declined to comment. Roach arrives as the Financial Services panel is beginning to organize its investigation, the people said. He has most recently worked for the minority staff of the Senate Banking Committee, where he has been reviewing Wall Street’s compliance with government settlements. Waters, who became the Financial Services chairwoman after Democrats took over the House in January, has called investigating Deutsche Bank one of her top priorities. She has agreed to cooperate with the House Intelligence Committee, which is also interested in the bank. 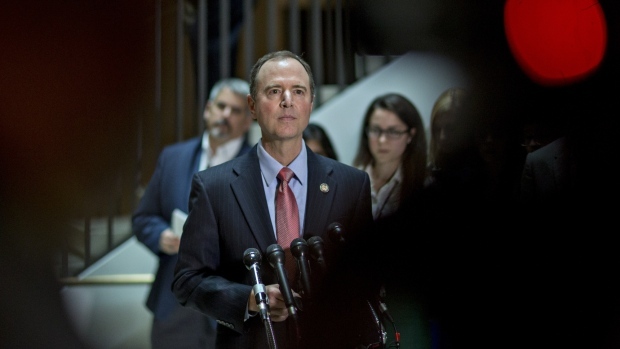 The Intelligence panel, led by Representative Adam Schiff of California, is examining alleged money laundering involving Russia and the Trump Organization, the president’s former business that is now run by his sons, Donald Jr. and Eric. That committee is also making several hires -- including people with backgrounds in finance and forensic accounting -- according to three officials familiar with the matter. People familiar with the Financial Services committee said it hasn’t yet developed concrete plans for tackling the Deutsche Bank issues. That is likely to change soon, they added, as the panel staffs up. Along with the Roach hiring, one person said, the committee has been looking for someone with a background in investigative reporting to help write reports. Waters began to pay particular attention to Deutsche Bank in 2017, asking the lender to provide detailed information about its relationships with Trump and his family. Because the committee was controlled by Republicans, who did not share her interest in examining the bank’s loans to Trump, Waters’s efforts went nowhere. Now, with the power to issue subpoenas, the California Democrat can demand detailed client information from Deutsche Bank. Waters has also looked at Deutsche Bank’s role in helping wealthy Russians move more than $12 billion worth of rubles into the western financial system through a practice known as “mirror trading.” The Federal Reserve, the U.K. Financial Conduct Authority and New York’s Department of Financial Services have all fined Deutsche Bank for its lax oversight of the Russian money transfers. The Department of Justice conducted its own investigation into the scandal and appeared to be close to sanctioning the bank in the last months of 2016. Following Trump’s election and the installation of new leadership at the agency, the investigation into mirror trading appeared to stall. Waters is likely to renew her request to the Justice Department for an update on it. Roach, 66, cemented his reputation as a Wall Street nemesis during his tenure on the Senate investigations subcommittee where he worked, most notably, under former Senator Carl Levin, a Michigan Democrat. Roach, along with the subcommittee’s chief counsel, Elise Bean, conducted deep dives on issues like abusive tax shelters, money laundering and the financial firms that helped prop up Enron. “Your people think it’s a piece of crap and go out and sell it,” Levin said as he harangued Blankfein. Though Goldman garnered much of the public attention in that investigation, Deutsche Bank was also highlighted by the subcommittee for peddling collateralized debt obligations that its own traders believed were likely to lose value. Deutsche was also singled out in an investigation Roach handled involving hedge funds’ use of complex financial products to avoid taxes. The subcommittee’s 2014 report accused Deutsche Bank and Barclays Plc of marketing certain types of options to hedge funds that allowed investors to improperly reduce their tax burdens. Renaissance Technologies, one firm that bought the options from the banks, avoided more than $6 billion in taxes over 14 years, the report concluded.